Celery can be a great alternative for chips when eating dip, but that’s not all. Instead of a tuna salad sandwich, swap out your bread for celery to incorporate more vegetables in your daily diet. This recipe, created by a HealthWorks student, includes carrots, red onions, and celery, of course. Vegetables like carrots are an excellent source of Vitamin A, which helps to keep your eyes healthy. Place tuna in a small bowl and use a fork to break the tuna apart. Add the vinegar, red onion, carrots, grapes, yogurt and pepper. Mix well with spoon. Spoon tuna salad into the center of each celery rib. Enjoy right away or store in an airtight container and refrigerate for later. Did you get crafty in the kitchen? 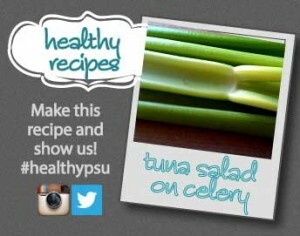 Take a photo on Twitter or Instagram with the hashtag #healthypsu so we can share your creation on our blog.